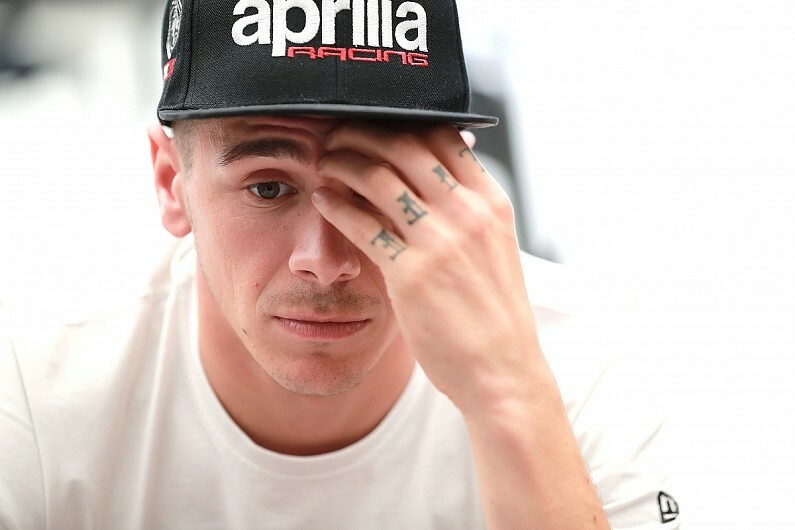 Aprilia's Scott Redding feels he was risking his life "for nothing" and was "wasting" his time during MotoGP's qualifying at Jerez, after problems with traction relegated him to last place. Redding was 10th fastest in Friday's first practice session, but dramatically slid to 24th in the hotter second outing on his RS-GP. The Aprilia rider once again struggled for pace on Saturday, blaming a complete lack of rear traction which only worsened when he had to push in qualifying. "I don't know, just no grip again, no rear grip, we spin and spin and spin and spin," said Redding, when asked about his dismal qualifying. "Both tyres, I don't know if it was tyre or chassis, but just nothing there. I'm struggling for grip anyway, so when in qualifying you need to make another step I just spin more and get no benefit from it. "So, that's where I struggle most now. I was trying to get more, but there was nothing there, it was just spinning. "I don't really know what to do, and I come in because I was f**king spinning forever, like [it] never ever stopped spinning. "I said I'm just wasting my time, I'm just risking my life for nothing. I could push even harder, and the result is gonna be the same. "I'm pushing hard as I can, if I go over that limit I'm not going to get any benefit from it. We need to understand why it's like this, and we need to come up with a solution for tomorrow." Redding believes he will be able to enjoy a stronger performance in the race, but is against making any radical changes to his RS-GP after a similar move last time out in Texas backfired. "That's what I did for Texas and I f**king shot myself in the foot," he added. "I think tomorrow I have a better chance in the race than I do in qualifying, so I probably gonna go with the hard front and the medium rear. "When the bike's with used tyres it works better for me, so stick with this set-up and maybe try something with the electronics."